Quintette is a unique band. 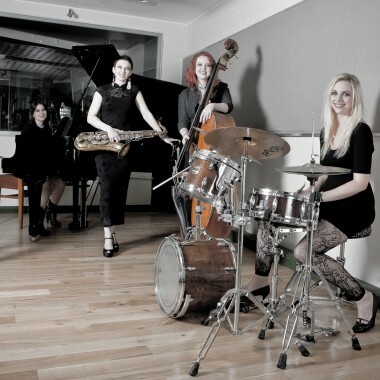 Not only is it an all Female jazz band for hire, but all the music they perform has been specially arranged to feature the individual players in the group. They can go out as a trio minimum and also offer trumpet, sax and percussion working with a DJ to enhance a dance set by improvising and riffing over backing tracks. "They were incredibly professional, looked great and sounded amazing, so please do send a big thank to them from all of us." If required, the ensemble can also feature the sensational vocalist, Sumudu Jayatilaka. The musicians featured arise from a contrasting spectrum of musical backgrounds: Yazz Ahmed, on trumpet and flugelhorn, often worked with Sir John Dankworth and now not only performs regularly with a variety of Britain’s top jazz musicians such as Lawrence Cottle, but can also be heard with the likes of pop and rock artists such as Jack Penate and The Manic Street Preachers. Josephine Davies, on tenor sax, frequently performs with artists such as Jamie Cullum, Georgie Fame and the Ronnie Scott’s Vanguard Band. Josephine was the winner of the Perrier Young Jazz Ensemble Award (1999) with a quintet led by trumpeter Tom Allen. On piano, Naadia Sheriff, has toured across Europe with The Rat Pack, has been featured as a soloist with the New English Orchestra, and has played with many British jazz musicians such as Alan Barnes and Steve Waterman. Charlie Pyne, the youngest member of Quintette, has studied with some of the world’s best bass players: Jeff Clyne, Steve Watts and Omar Puente for example. Charlie regularly performs with rock bands including Charlotte Hatherley (formerly of Ash) and at Salsa parties and swing dances as well as contemporary classical concerts. Sophie Alloway, a versatile drummer, has toured with Roots Manuva, and has played with jazz greats such as Stan Sulzman, Julian Joseph, George Melly and Mornington Lockett. Vocalist Sumudu Jayatilaka, a natural performer and composer, made her television debut at the age of 15 on the BBC Pebble Mill’s A Song For Christmas, performing one of her own compositions. 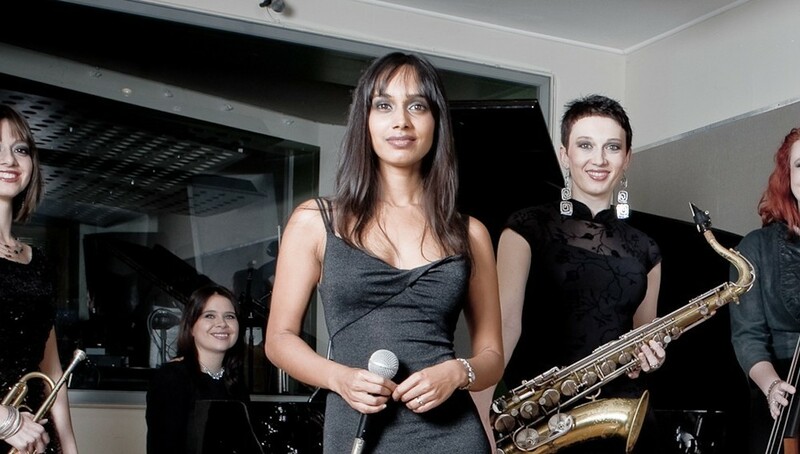 Sumudu performed as a soloist on Millennium eve at the Millennium Dome and collaborated on her first album with Grammy Award winning producer Kipper (of Sting fame), and British jazz piano legend Jason Rebello. Quintette performs music from an extensive repertoire. As well as popular jazz numbers from artists such as Diana Krall, Jamie Cullum, Glenn Miller, and Frank Sinatra, Quintette also write jazz arrangements of well known pop tunes from The Beatles, Amy Winehouse, and Stevie Wonder for example, and of classical composers such as Bach or Elgar. The group can arrange any particular piece of music in advance at the client’s request. This spectacular group of musicians is available for parties, weddings, dances, corporate events, dinners and for background music.